Although the jonquils planted by the original owner of our century old house were planted in great clumps around the periphery of the yard AND they have been blooming profusely for the past three weeks, the sun has been out for only a few hours at most–and usually when I am at work. Yesterday was a lovely day filled with sunshine, the puddles in our driveway nearly all dried up and so I ran inside and grabbed my camera for some photos. The jonquils have a light delicate scent which surprised me as I sat on the ground to take photos. 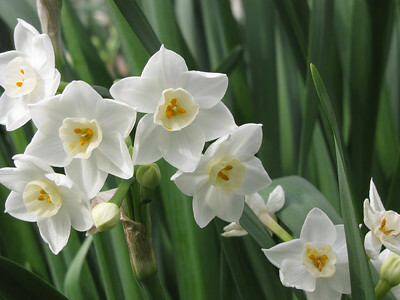 The snowbells were camera shy this year but I managed to get some nice shots of the jonquils. Every year someone comes up to me and asks if I knew all those jonquils were there–we’ve lived here since 1984 and it would have been hard to miss the profusion of azaleas, camellias, jonquils, and snow-bells. Some years ago, I put four earthenware flues on the corner of my front yard. I’ve planted all sorts of interesting things in there including cotton, okra, cilantro, and for the past few years a selection of phlox and zinnias which self reseed themselves. I only have to pull out the weeds over winter and then deal with the fire ants that seem to love that corner. A gardenia blooms almost constantly from mid June on and there are some lilies that put on a spectacular show in June. Can you tell I’m ready to dig in the dirt and plant my spring garden? We have harvested some lettuce and the broccoli from the winter garden. It’s time to plant peas and cucumbers and try again with tomatoes.